Have you ever thought of putting lobster on pizza? 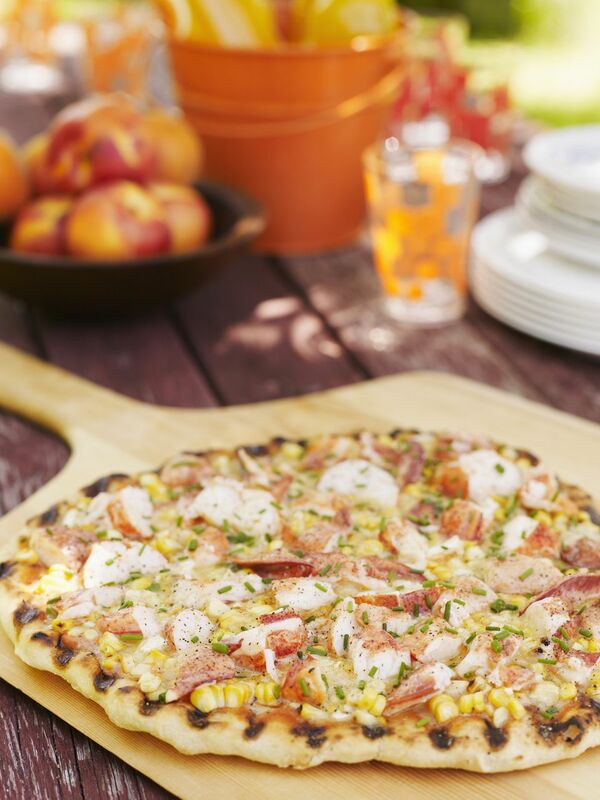 When I was in Maine a few summers ago I ate lobster every chance I got, so when I saw a Lobster Flatbread Pizza on the menu at a restaurant I had to order it. I wasn't sure what to expect, but let me tell you, it was delicious. I finally got around to trying to recreate it at home, and now you can enjoy it too. It's a great way to have a little taste of the ocean with your pizza. This dish is perfect as an appetizer or a main course. This takes more time to prepare than an average pizza, but it's worth it, as is any recipe with lobster in it. ** Boil or steam live lobsters. Boiling is a little quicker and easier to time precisely, and the meat comes out of the shell more readily than when steamed. Boil the lobsters for 12-20 minutes or longer, depending on the size of the lobster (12-15 minutes for 1 pound lobster, 15-20 minutes for a 1 1/2 pound lobster, 20-25 minutes for a 2-3 pound lobster). The lobsters should be a bright vivid red color when done. Place dough in ​a bowl and bring it to room temperature. Cover and let rest until it doubles in size, about 1 hour. Preheat oven to 450 F, with a pizza stone, if using. Punch dough down. Hand-stretch the dough to form a circle. Place on a well-floured pizza peel if using a pizza stone, or onto a pizza pan. In a small bowl, combine minced garlic and olive oil. Use a spoon or brush to spread garlic-olive oil mixture over dough. In a medium bowl, combine cheeses. Sprinkle half of them over the dough. Arrange lobster evenly over cheeses and sprinkle with thyme and red pepper. Finally, sprinkle with remaining cheeses. Bake in ​the oven for 20-25 minutes until the crust and the top of the pizza are a golden brown. Remove from oven and serve with lemon wedges. This pizza would be great with some vegetables on it as well. I suggest artichoke hearts, mushrooms, or asparagus. Try it with one or all three! You could also use a cream-based sauce instead of the garlic-olive oil for something really rich and tasty. This pizza would also taste fantastic on the grill. You could even grill the lobster a little beforehand.